Before we talk about the ways you can balance the doshas, let’s clarify what they are and why they are so important for Ayurveda. According to Ayurveda, every living being on Earth is made up of five basic elements – fire, earth, water, ether and air. Even at our conception, these five elements combine with each other and form three doshas, which we call Vata, Kapha and Pitta. These three doshas are found in each of us, but in the way they were configured during our conception, one of the doshas is the main and leading one. Sometimes, for various reasons, such as poor nutrition, accumulated stress, climate change or even a change in the city where we live, the balance of the doshas is distorted and this can lead to a number of health and emotional problems. How does aromatherapy help to balance the doshas? Aromatherapy is one of the most ancient and effective natural remedies for balancing the doshas. Each oil used in Ayurveda has special properties that help us relax, concentrate, restore strength, balance our emotional state and fight off various health issues. 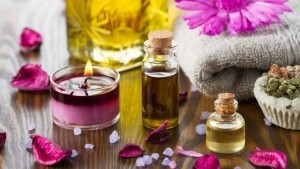 Precisely because of the unique healing properties of aromas, aromatherapy is a very important part of the Vedic holistic treatment system. Knowing and making use of the properties of various essential oils in accordance with the type of constitution, Ayurvedic treatment can quickly restore the balance of the doshas and help us feel strong, healthy and happy with life once again. Ayurvedic doctors use essential oils for treatment of a wide range of illnesses. The list of beneficial properties of essential oils is so great that it is not possible to fully describe it. Some of them help with wound healing, have anti-inflammatory and antiseptic effects (such as cedar, pine, fir and chamomile oil). Others increase efficiency, concentration and improve memory (such as fir, ginger, tea tree, lemon, basil, verbena, rose). There are essential oils that cleanse toxins and carcinogens – such as dill oil, lemon grass, rosemary, pepper, cedar cypress, etc. There are even essential oils that can be used as safe and natural insecticides, such as geranium, eucalyptus or juniper oils, while oils such as ylang-ylang, sandalwood, mint, tangerine, cardamom are used to slow down the aging process. The use of aromatherapy, and in particular essential oils, is truly immense, but more importantly, all of them, regardless of their individual properties, can be used for both treatment and prevention of illnesses, for beautification, relaxation, slowing down the aging processes and much more. Ayurveda classifies essential oils according to their effect on body temperature and how this affects the doshas. According to this classification, hot and warm essential oils are suitable for cold constitutions such as Vata and Kapha, while cold ones are suitable for Pitta. Such categorisation of oils applies not only to Ayurveda, but is also supported by modern medicine, which claims that cooling essential oils have a negative electrical charge or, in other words, the atoms they contain have free electrons that have the ability to extract heat from the body and cool it. Likewise, warm, essential oils can warm the body, raise body temperature, and speed up all metabolic processes. Take a bath after adding chamomile and mint essential oils to the water and you will soon feel a fresh and cooling effect on your body. If you want to feel the warming effect of essential oils, then add thyme essential oil to the bath water. Another way to classify essential oils in Ayurveda is their separation depending on the degree of dryness or moistness. It is easy to determine if the oil is dry or moist and you can try this at home too. If, despite your efforts, the drops do not dissolve but remain as a film on the surface of the water, then you are dealing with dry essential oils such as fir, pine, cedar, lemon, tangerine, sea buckthorn etc. There are also essential oils that have a neutral character and they are able to adapt to the needs of the body. Such oils are lavender, sage, salvia, basil, anise, tarragon etc. For the Vata constitution, the leading elements are Air and Ether. Because these elements are vital, this type of dosha is characterized by coldness, lightness, agility and dryness. People with this type of constitution often suffer from insomnia, constipation, headaches, dry skin, have nutrition problems and/or anxiety. To restore Vata dosha’s balance, the oils used must be sweet, soothing and warm. Such essential oils are warm tonic oils such as cinnamon, camphor, eucalyptus, bergamot and soothing oils such as sandalwood, rose, jasmine. It is good to apply these oils mixed with base oils of sesame, ricin or avocado. Other oils that are suitable for balancing Vata dosha are vanilla, lavender, lemongrass, lemon, ginger and ylang ylang. These essential oils facilitate fast and effective body detox (ama), cleanse the blood and normalise digestion. However, they should only be used to stabilise Vata dosha and then replaced with more neutral oils such as lavender, for example. People with Pitta dosha are made up of the elements Fire and Water, have a hot and intense character and often suffer from ulcers and inflammation of the skin. To balance the Pitta Constitution, it is best to apply oils that stimulate sweating and have a cooling effect, such as jasmine, gardenia, rose, mint and chamomile, yarrow, and to combine them with base oils such as sunflower, coconut oil or olive oil. For the Pitta Constitution, dry oils such as saffron, St. John’s Wort, white yarrow are recommended. These oils strengthen the tissues and also improve the condition of the skin, treat small wounds, prevent the loss of liquids. To improve the digestion of the Pitta Constitution and to normalise the energy levels, use essential oils such as lavender, chamomile or balm. Kapha dosha consists of the elements Earth and Water and is characterised by a cold character and slow movements. People with this type of constitution are prone to cold and respiratory diseases and therefore the right oils for them are warming, stimulating oils such as basil, cedar, myrrh, sage, anise, laurel, birch, ginger. One of the main problems faced by the Kapha constituents is lymph stagnation, accumulation of mucus and other body fluids, and delayed metabolic processes. To deal with these problems Ayurveda uses essential oils that have the property of strengthening the body like parsley, dill, cinnamon, coriander, lemon grass. Once the metabolism is activated, essential oils such as cardamom, coriander, chamomile, juniper, sage, eucalyptus and others that combat pathogens must be used. They speed up the process of removing excess fluids, as well as toxins (ama). To balance the digestive system of Kapha dosha, it is advisable to use orange peel, basil, cardamom, cinnamon, laurel and juniper essential oils. How do we apply essential oils? The therapeutic Ayurveda message has its own healing mechanisms. 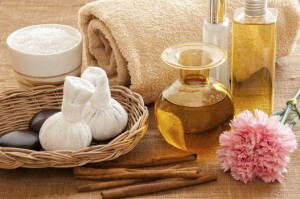 The combined action of massage and essential oils improves lymph and blood circulation. Aromatic substances also affect the emotional centres of the brain that control our mood. Sauna with essential oil extract helps to clean the bronchi and skin and has an antibacterial effect on the body. Inhalation is an excellent treatment for colds and respiratory problems. The method is also suitable for cleansing the face. A bath with essential oils helps relieve fatigue, relaxes the muscles completely and improves mood. Compresses help with headaches, bruises, sprains. Refreshing – peppermint, lavender, tangerine, lemongrass, orange, fir, lemon and other essential oils have this effect. Relaxing effects – ylang – ylang, camomile, lavender, basil, balm, orange, mimosa, sandalwood, vanilla, cedar. Soothing effects include lemon, lavender, jasmine, dill, chamomile, vanilla, wormwood oils. Against depression and severe mental conditions – the essential oil of bergamot has the greatest effect. Stimulating effects – coriander, musk, juniper, cloves, mint, lemon, rosemary. Cleansing properties – aromatic oils of geranium, lavender, magnolia, musk, orange, rose, rosemary, sage, lemon. The aromatic oils of geranium, jasmine, tangerine, mimosa, orange, marjoram, rose and sandalwood harmonise and balance. Elevating mood effects – jasmine, bergamot, cardamom, geranium, tangerine, patchouli, orange, rose, sandalwood, ylang ylang, sage, lemongrass. Soothing and relaxing effects – musk, mint, rosemary, wormwood, cedar, lavender, lemon oils. Geranium, jasmine, bergamot, coriander, lavender, mimosa, patchouli and other essential oils have an anti-stress effect.